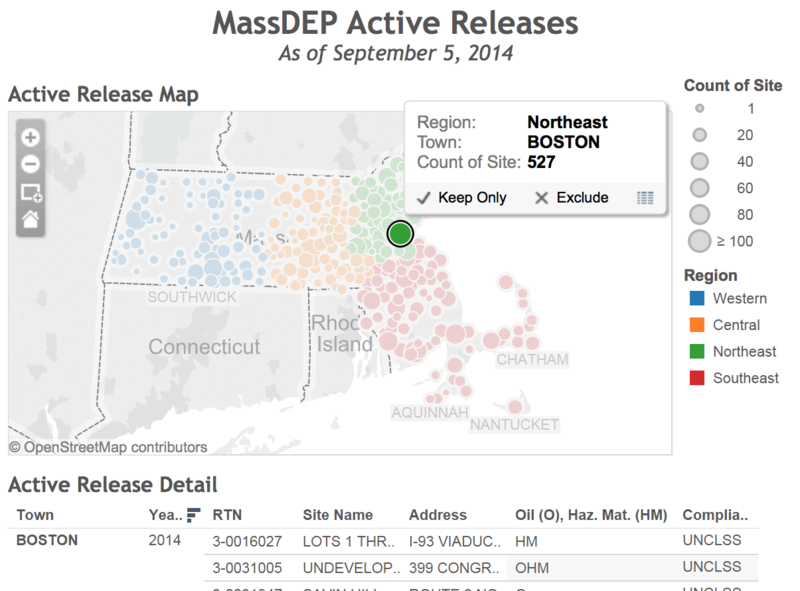 Jump right to the MassDEP’s site page for a release with this bookmarklet. It prompts you for the Release Tracking Number (RTN) or it uses the selected text on the page if you have anything selected. Create a new bookmark in your browser (e.g., Safari, Mozilla). Give the bookmark a name. Select your bookmark and enter a tracking number, like 1-12345 and press OK. 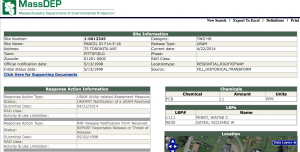 The MassDEP regularly publishes general information about all releases or threats of releases of chemicals or hazardous material into the environment. The map below shows the active releases, ones for which remediation activities are on-going, and groups them by town. Select a mark on the map to see details of releases in a city or town. The table includes site information like category of release and compliance status. To get to the MassDEP site page for the release, click on a cell in the table and then click the link in the popup window. Definitions of some of the terminology used can be found in this glossary. 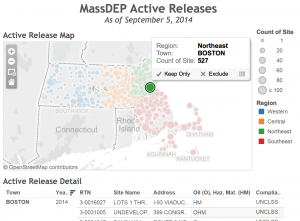 Sources: MassDEP site information, Google Maps API for geocoding. Check out the video of my Bill of Lading Presentation. It provides more explanation behind the data and the graphs. If you want to download the presentation, you can download it here. 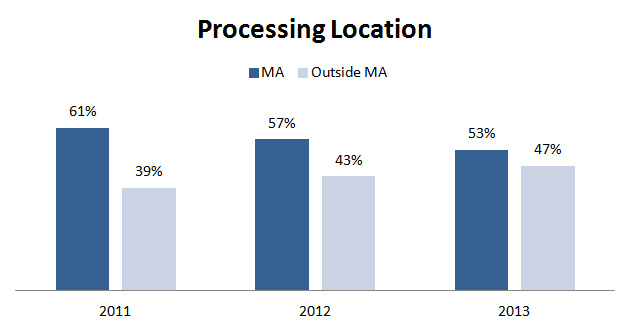 This plot shows the non-hazardous remediation waste processing locations in New England as reported in MassDEP Bureau of Waste Site Cleanup Bill of Lading submissions from 2011-2013. The larger the circle the more times the location or zip code is mentioned in the submissions. The largest circle in Massachusetts indicates 405 mentions; the smallest, 1 mention. The originating source of the material and quantity are not shown. Site cleanup efforts within Massachusetts over the past three years have relied more on remediation waste processing facilities outside the Commonwealth. According to filings with the MassDEP from 2011 to 2013 the proportion of shipments going outside Massachusetts went from 39% to 47%. 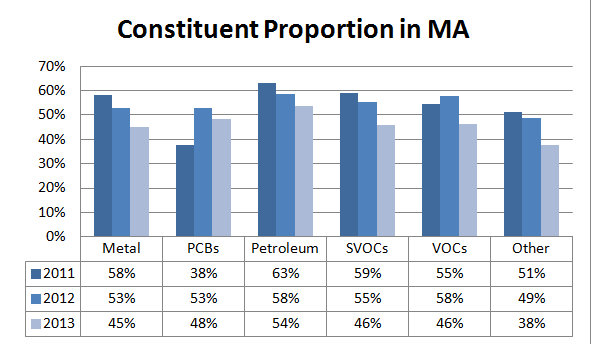 The proportion of constituents and contaminants processed out-of-state increased for all categories except PCBs and VOCs. Looking at a sampling of soil-based remediation waste that was electronically attested and quantified by the receiving facility, 63% of submissions, a significant difference in quantity is observed between 2012 and 2013. In 2012 230,000 tons of contaminated soil was processed in MA while a little over 200,000 tons was processed outside MA. 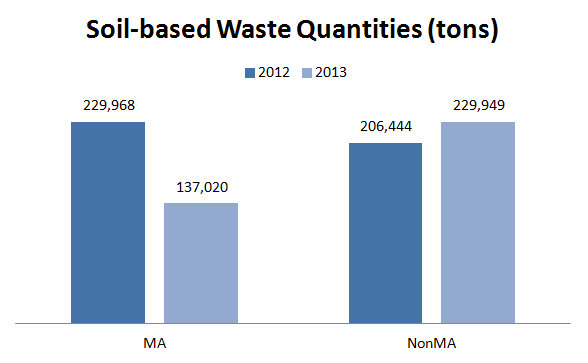 In 2013, soil processed in MA dropped to 137,000 tons while it increased to 230,000 tons outside MA. What factors are influencing these trends? Regulations? Economics? Are these trends continuing? What role do LSPs, transporters, processing facilities and PRPs play? If you have questions about the data or the analysis, please contact me or leave a comment below. Special thanks to the Bureau of Waste Site Cleanup for making the Bill of Lading data available for analysis.